It'll almost be a crime if I try to introduce Lionel Messi - such has been this man's prowess. It has been almost 14 years since Messi first started making us watch him in awe with his stupendous performances. He has had a magnificent career until now, and is widely considered one of the best footballers ever seen. 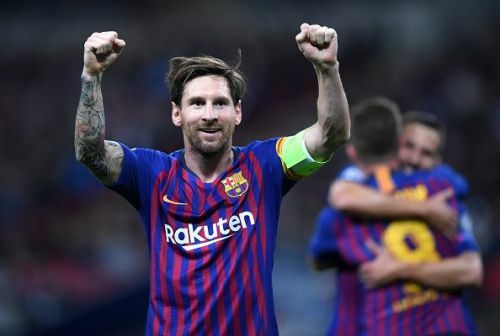 Like every season, Messi has been in sensational form this year too - he is the highest goalscorer and assist provider in Europe with 30 goals and 11 assists. Although he has always baffled us with the consistency he shows, let me try to predict how many goals the Argentinian maestro will end up with after he hangs up his unfailing boots. As of today, Messi has 647 goals with club and country excluding friendlies. FC Barcelona: He has been averaging at least 45 goals every season. The Blaugrana legend is expected to stay at FC Barcelona for around three more years. Even if we assume that his goal-scoring exploits reduce by let's say 5 goals per season, he will have 120 (45+40+35) goals over the next three seasons. USA: He will probably then leave and play for a couple of seasons for an American club in MLS. There, Messi will score around 25 goals per season at least, which means he will likely score around 50 (25+25) goals in America. Newell's Old Boys: To fulfil his childhood dream, he will move to his beloved Newell's Old Boys in Argentina for his last chapter. In his home country, he will likely play for three seasons, scoring around 20 goals per season as he would be 36 by then. In Argentina, he will likely score 60 (20+20+20) goals. International: Seeing the current state of the Argentina national team, Messi will probably retire next year from international football after the Copa America. He will likely add around 10 goals to his international goal tally. Total goals: 647+120+50+60+10 = 887 freaking goals! Fun fact: Pele scored 757 goals excluding friendlies. One thing we can be sure of is that Messi will definitely score at least 800 goals. We, mere mortals, should enjoy this man and his brilliance because a day will come when we won't be able to witness the genius anymore.